The Inuit of southeastern Hudson Bay have been harvesting eiderdown for generations. It is one of the warmest natural materials available and is perfect for the creation of winter clothing. 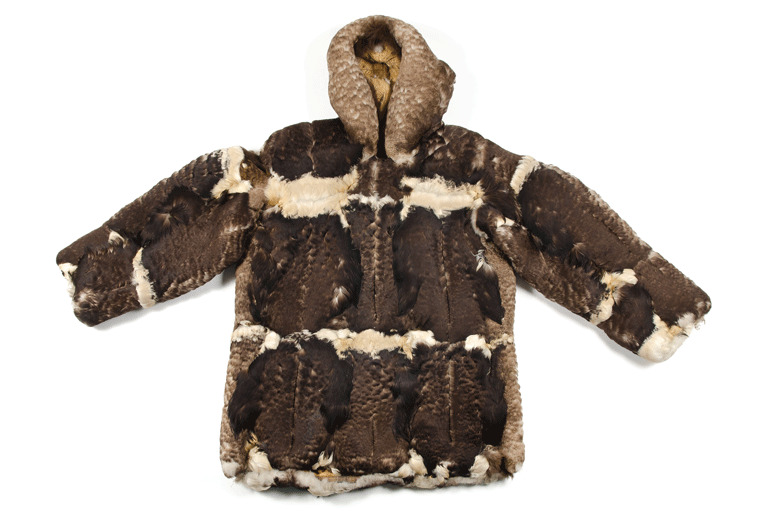 This parka from the Belcher Islands consists of a number of eider duck skins sewn together and a hood trimmed with either dog or wolf fur. Some of the artifacts in the HBC Collection come with great provenance — that is, we can track the ownership of the object and sometimes even who made and used it — and it’s often this information that gives the artifact its historical significance. In this case, the parka once belonged to Peter Sala, one of four men convicted of manslaughter in the killings of nine people in 1941. That winter was particularly harsh for communities on the Belcher Islands, as seals were becoming scarce, the weather was awful, and trade opportunities were disrupted with the Second World War in full swing. While the crimes made national headlines — and the trial was unusual, as it was held in the Belcher Islands — it is important not to sensationalize the story. The community of Sanikiluaq is still affected by the legacies of these crimes, and this parka is part of the material history of this dark period for the Sanikiluarmiut. This article originally appeared in the December 2016-January 2017 issue of Canada’s History magazine. Its exceptional quality is a reflection of the expert eye and skills of Lydia Catherine Christie. Bale seals are one of the most commonly forged Hudson’s Bay Company artifacts on the market. Chilkat blankets are one of the best examples of the Northwest Coast’s exceptional weaving industry. These saddles were made by women, and Métis women have been credited with exceptional expertise in their creation. An example of early twentieth-century fashion in a moose-skin dress.